Terry Moore first rolled down the Mother Road, Route 66, in the back seat of a 1953 green Studebaker; he was nine years old. His family was on the move in the summer of 1953 from Minnesota to Claremont, Calif.; he still recalls the startling sight, in Cucamonga, of eucalyptus wind breaks on the side of citrus groves. Terry’s fine work as a freelance photojournalist led him to cover stories on the Southwest for “National Geographic,” the “New York Times,” “Smithsonian,” and scores of other publications — more often than not, traveling by car, which took him either on or near the Mother Road. He also photographed a number of books on the architecture of the Southwest, and this is how I met him. In 1986 Nora Burba Trulsson and I were commissioned to write a book for Bantam, “The Desert Southwest” (1987), on the subject of architecture in the desert portion of Southern California, Arizona, and New Mexico (and a bit of West Texas). Terry Moore was to be our photographer. “Desert Southwest Gardens” followed in 1990, and I can tell you what influence Terry has had on me. First: Never underestimate how the beauty of sky and land captures the imagination and the heart. Second: Never pass up a great fish taco. Both are fixtures of my life. US Route 66, opened in 1926, was one of the original roads mapped to connect this spread-out country of ours from sea to shining sea. The Mother Road then reached two-thirds of the way across the country, 2,448 miles, from Chicago to “L.A.” as the song goes. But we know it is really Santa Monica; a sign at the edge of the Santa Monica Pier marks the end of the road and of the continent. One of Terry’s images shows an eerily silent and still Santa Monica and its bay, at dawn, in 1996. The song was written in 1946, on the road itself, by Bobby Troup, traveling with his wife Cynthia, in their 1941 Buick, from Pennsylvania to Hollywood. Troup thought perhaps he’d write a song about Highway 40. Forget it, snapped Cynthia (I imagine), in one of the great bits of spousal advice in American popular history. “(Get Your Kicks on) Route 66” rhymes, she said. Nat King Cole’s 1946 version — recorded the same year it was composed — was a hit. So is Terry Moore’s new book with its luminous images of what our country once was. 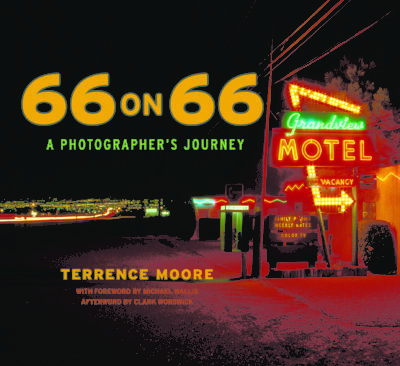 “66 on 66: A Photographer’s Journey” is available Dec. 1 at Chevalier’s Books, 126 N. Larchmont Blvd., 323-465-1334.